Garmin's new Virb action camera enters a crowded market with good options at the top (GoPro Hero3 Black Edition) and bottom (Monoprice MHD) of the price range. It's a little late to the game, but it's got enough features that you might consider it against the alternatives. The Virb is a chunky 6.26 ounce camera that's heavier than its competitors. It comes in regular and elite varieties, but really, only the latter makes sense because it comes loaded with GPS as well as Wi-Fi so you can control it remotely. Both cameras come with a built-in 1.4-inch display that uses the sun's light for their own radiance to conserve energy (smart!). The cameras are waterproof down to one meter for up to 30 minutes. 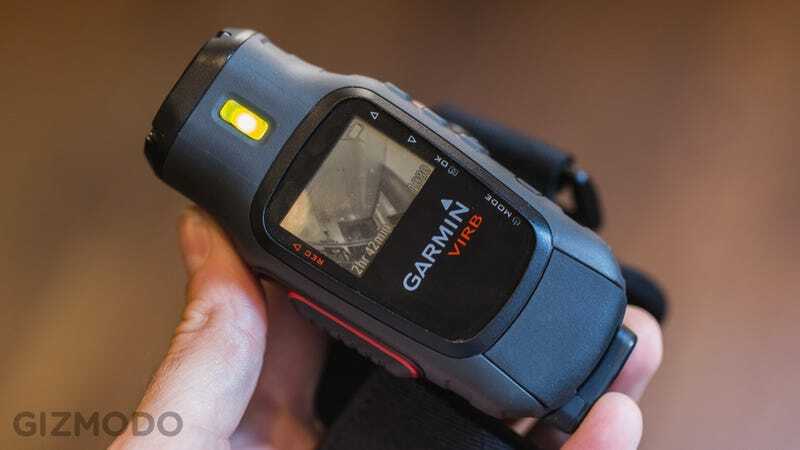 Garmin says the products are larger than others because they promise industry-leading battery life: Three hours versus 2-2.5 hours on other action cameras. As for its shooting specs, the Virb shoots the standard 1920 x 1080 footage 30 fps. You'll have to scale down to 1280 x 720 to record slow-mo friendly 60 fps footage. The cameras shoot 16-megapixel stills. Here's a listing of available mounts: Shoulder, head, wrist, bike (2), tripod, and a fabric head strap. There's also an adapter for use with mounts from other manufacturers. The Virb will cost $300 and the Virb Elite will cost $400. At those prices, you can get a top GoPro, so the beefy Virb is going to have to deliver on image quality if anyone is going to pay attention to it. Available September.